A companion to – or variation on – a similar composition of the same year, Still life with a glass jug and an apple. That has a portrait format, however; the present painting has a landscape or horizontal axis. 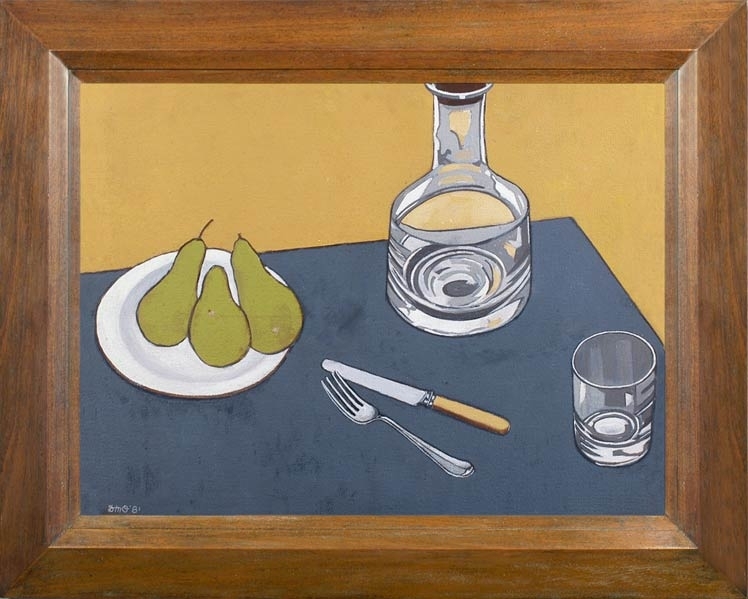 Otherwise, both works have the same simplicity, the same raised viewpoint, and the same small colour range – a dull blue ground, light ochre background and green fruit. This is the radical minimalization of a traditional still life, which marries the pop art approach of a Roy Lichtenstein with the classical refinement of a Chardin. Look how beautifully drawn the knife and fork are, completely in synchrony with the perspective of the plane they inhabit. This is a timeless and serene space, where degradation and decomposition cannot occur.